Trophy Room - All your trophies are located in the Trophy Room. You need to earn at least one trophy to unlock it. Current Location - The location you are currently in. Points - Points indicate your game progress and can be earned in several ways: by finding items in the locations, getting trophies and playing mini-games. 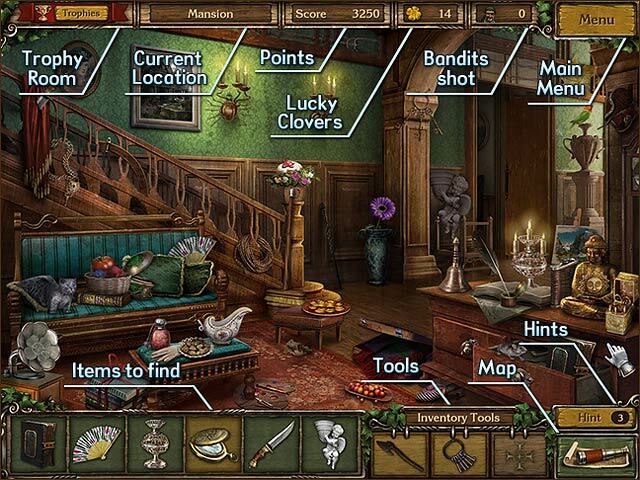 Lucky Clovers - From the Mansion and on locations contain lucky clovers, from 2 to 4 Lucky clovers per location. Collect 150 Lucky clovers to unlock the Secret Mission. Bandits shot - The number of bandits you shot down. Main menu - Go to the main menu. Items to find - Items in the green background are normal items. Items in the blue background will be used in the mini-games at the end of the episode. 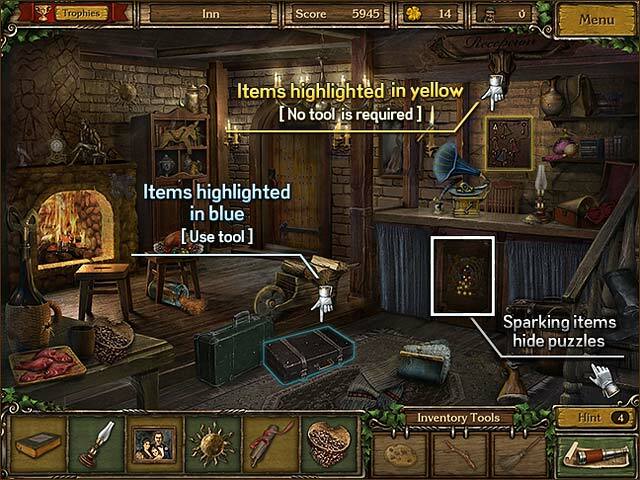 Items in the yellow background can be either inventory tools or clues; some of them can be hidden behind or inside other items. Tools will go to your Inventory. Tools - Inventory items which you can use to interact with other items in the location. Hints - The number of hints you have at the moment. You start the game with 3 hints. If you run out of all hints, bar hint will be recharged. You can also earn hints by shooting bandits who pop up in scenes throughout the game. Map - Press Map to leave the current location. You can move to another location in the current episode, if it is available. Items highlighted in yellow - Click on such items to find an item hidden behind or inside them. Items highlighted in blue - Use a tool from your inventory to interact with the items highlighted in blue. 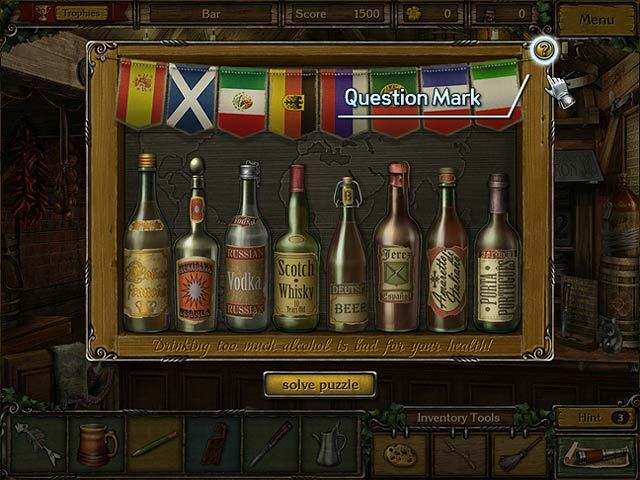 Sparkling items – Sparkling items hide puzzles. Use one of the items from Inventory Tools with items highlighted in blue to play the puzzle. If a sparkling item is highlighted in yellow no tool is needed. Question Mark - Click on the question mark in the upper right corner of the puzzle window for help.